We are excited to announce that the Master Tom artwork (pictured below) by the Strange Case Company will be auctioned at this year’s Dine with the Stars on Thursday 18 October. Master Tom is a one-off piece of art which has been kindly donated by Jamie Durrant of the Strange Case Company. It is based on a selection of Tom of Finland’s illustrations, with the subject wearing the iconic “uniform” of a clone: black leather jacket, black cap and chains. 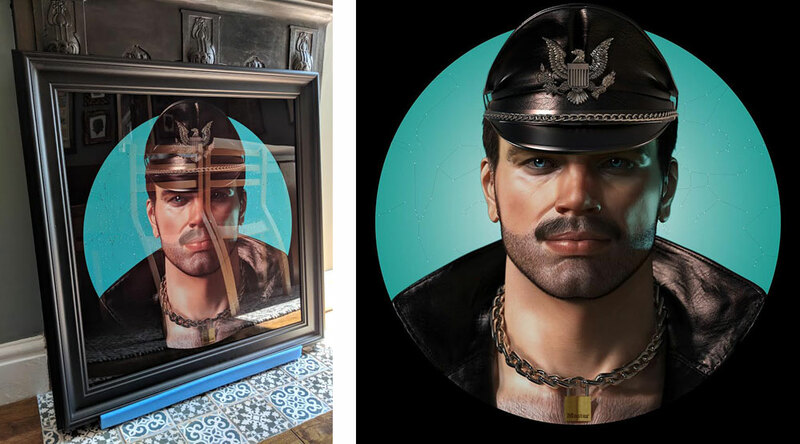 This framed piece measures 72.5cm by 72.5cm, and is finished with Swarovski Crystals representing the constellations that would have appeared on the night that Touko Laaksonen (Tom of Finland) died, 7 November 1991. This limited edition of one is printed on aluminium and has an estimated worth of £2000. It has to be seen to be truly appreciated, and can be viewed at Prowler in Brighton. The auction will take place at the annual Dine with the Stars at Jury’s Inn Brighton Waterfront on Thursday 18 October, from 6.30pm to 12.30am. Tickets are £29 each, and include a three-course gala dinner. You can also choose which table of the 14 Brighton and London cabaret stars you wish to be on. All of them will be performing throughout the night. For tickets to this incredible event, please call 01273 725331. The whole event and this auction will raise money for the Brighton and Hove LGBT Community Safety Forum who provide essential services across the city. Those unable to attend on the night can still bid by phone. For more information about this, please contact us. Stars on the night will include Davina Sparkle (host), Miss Jason, Dave Lynn, Miss Lola Lasagne, Jason Lee, Miss Disney, Spice, Kara Van-Park, Matt Rodd (Mr Gay Europe and UK), Mrs Moore, Maisie Trollette, Sally Vate, Heart & Soul, Suspiciously Elvis and Jennie Castell.